Hal Junior lives aboard a futuristic space station. His mum is chief scientist, his dad cleans air filters and his best mate is Stephen ‘Stinky’ Binn. As for Hal … he’s a bit of a trouble magnet. He means well, but his wild schemes and crazy plans never turn out as expected! Hal Junior: The Secret Signal is such a fun book! 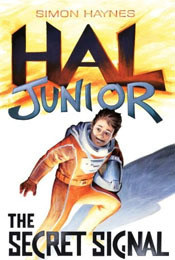 Hal is a curious, mischievous boy living on a space station. When his classmates and mother are kidnapped on a docked spaceship, Hal has to use all his tricks and the help of a computer AI to try and save the day. Hal is such a typical kid. He gets into more scrapes that should be possible and yet always seems to come out on top. He’s endearing and funny, exasperating and brave and earnest. Hal is quite likeable and you find yourself both cheering and groaning at his antics. The writing kept a good pace and was quick and easy to read. The mystery surrounding the spaceship and kidnapping unfolds with some fun action scenes and a few twists and turns to keep things interesting. I enjoyed the sci-fi aspect of the novel and the mentions of things past that play an important part in the story – namely, Morse Code. I think Hal Junior: The Secret Signal is a book that will really appeal to younger readers searching for a fun, adventurous sci-fi story. It’s a nice introduction to the genre, with memorable characters and a tone of writing that is serious and yet also kind of cheeky. I think Hal Junior has very many adventures in his future and I would happily read any subsequent books. Paperback copy received from the author in exchange for my honest review. Thank you!